A 10k/10k transformer. 10K secondary with taps from 0 to -24dB in 1 dB steps. better than 100 kHz bandwidth on all taps. Mumetal can with colour coded leads. A 10k/10k transformer with secondary taps at 2 dB intervals. Maximum attenuation -10 dB. May be used in cascade with type 9150 to give a total of 50 dB adjustment in 2 dB steps.. Mumetal can with colour coded leads. 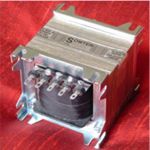 A 10k/10k transformer with secondary taps at 10 bB intervals. Maximum attenuation -40 dB. May be used in cascade with type 9155 to give a total of 50 dB adjustment in 1 dB steps. Mumetal can with colour coded leads. 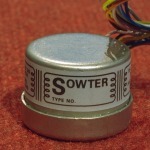 A 1:1 transformer for use with 4,8,or 16 ohm treeters. Eleven secondary taps provide frequency balancing in a loudspeaker system with a bandwidth up to 100KHz. A primary tap is privided to provide a 3 dB step up. Up to 50W at 400 Hz. 100% Mumetal core for minimal distortion and 100 dB dynamic range. Solder tags.